Q: How did the collaborations come about on "Zen" come about? A: Basically I first came up with the concept of the album "Zen" which I put in a note and from then I made a list of the people I wanted to collaborate with. These artist really like my concept and they all agreed to be on my album. I'm never 100% satisfied with anything I do, but from a collaborations stand point I think the album was a pretty good one. Q: Your sound is quite unique. What influences do you draw from? A: Everything on the earth and in my life is influences for me musically. Everything about everyday life - as well as these tours I go on and i'm on a European tour for a month and a half - but every experience I have everyday is brought into my music. So that's where my music comes from. I think it would be a very different sound if I grew up in America. I think the reason I have this sound is that I live in Tokyo now and a lot of my surroundings growing up and living in Tokyo has a lot do with the DJ Krush sound. Sometimes living in Tokyo i would like to take off my shirt and basically feel the sun. There are parts like that to parts in Tokyo but there are darker elements in crime which are important issues to be. I guess things like that are a big influence on a city in Japan. Q: Do you find a lot of mainstream hip-hop can be quite bland and unoriginal? A: There are people who work in the music industry with the more happy-go-lucky element of life but I am on the darker side or the issues that lie behind that. There is a dark hint in a lot of the things I do. But I am getting older so sometime I do want to do those more happy songs to so you may hear a little bit more of that. To be honest I do feel it to be a little bit bland. When I first started hip-hop and DJ-ing, hip-hop was a free-er form where anything was ok - whatever you felt you put in the rhyme and whatever you thought you put in the music. As hip-hop becomes a bigger and bigger business it seems like the creativity or what you can or can't do, there are more limitations cos' it becomes so big. I think the freedom and the mentality of the original hip-hop is becoming less and less and I feel that is very unfortunate. But at the same time there are a lot of people that are "mainstream hip-hop" so I don't mean to dis' that any respect. Its just my feelings. Q: What do you think of this rap-rock crossover music like Limp Bizkit? A: In the beginning because it was new I think a lot of people who were in hip-hop didn't know how to latch onto it or grasp it. But I think its just a new form and I like it a lot. I now look at music as music and I used to be genre specific (i.e. hip-hop has to be hip-hop and rock has to be rock) but if you take a step back and look at it as music then I think things like that are ok too. Maybe deep down because I am Japanese, hip-hop or rock music didn't come from Japan, I've been influenced from all types of music around the world so maybe that's the reason I do tend to step back and look at the big picture. Q: You're touring at the moment. How does it work live and do you find songs take on new forms? A: Recording is almost like growing a flower. Recording you start from zero, you give it water, feed it and basically hope it becomes a beautiful flower - and basically I think that's what the whole recording process is. DJ or live playing I see as sharing the same air - one place, one time - with the audience. Q: And finally, How does it feel to be called "The Godfather Of Abstract Hip-hop"? A: I started out in music to do something new and do something different and when people call be "The Godfather of Abstract Hip-hop" i'm honoured by it - but I don't consider myself a Godfather in any sense of the form. I'm not done yet, I'll carry on doing what I'm doing and basically pushing the limits on what I have to offer. 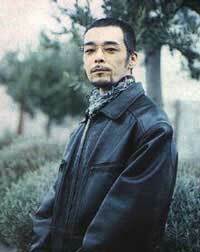 Basically make a genre in itself called DJ Krush and that what I would like to continue to do.